Lets chalk it up to lack of sleep and the cold he's fighting, but Adam is wrong about when the Grandparents Andersen last saw Margot. 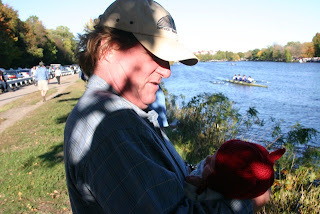 Since some cute pictures came out of our family adventure to The Head Of The Charles, here is the photographic evidence. Sadly, we didn't get any pictures from when he met Monica and Jack later on that day. It was a true family outing involving all of the dogs. 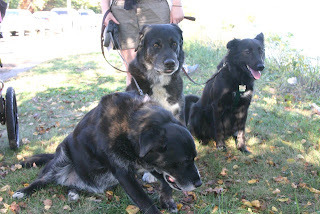 This was Jolly's first extended exposure to Sophie and Nanook. He's not so sure about other dogs in general, but it went pretty well. He was even tired enough by the end of the day to let me wrangle the three of them at once!